Flobot is field service job management software. It manages leads, estimates, quotations, scheduling, invoicing, payments and tracks assets. Flobot is an app and an online cloud system. Using them together gives you total control over your jobs and staff - and keeps your customers informed and happy. Flobot makes your company maximize profit and reduce administration overhead. It is used by facilities maintenance companies, plumbers, gas engineers, gardeners, window fitters, property maintenance companies, cleaners & maid services, mobile computer repairs, electricians, facilities maintenance companies, landscapers, removal & man and a van services, alarm fitters and carpet fitters. We even have an oil drilling company as a client! Some people call it the ultimate software for tradespeople. We call it Flobot. Quotes and estimates get built super fast, get to your clients instantly and look great. Makes you look great. Send your invoice now. And install the payment gateway to get paid in real-time. Stop chasing your invoices today. Schedule visits for quotes or jobs, send text messages to your customers to confirm. Get organised. Flobot is specifically designed for small businesses. Use Flobot to manage customers and work orders, schedule and dispatch engineers or technicians, create invoices, make quotes and estimates, produce reports, take payments and manage contractors. 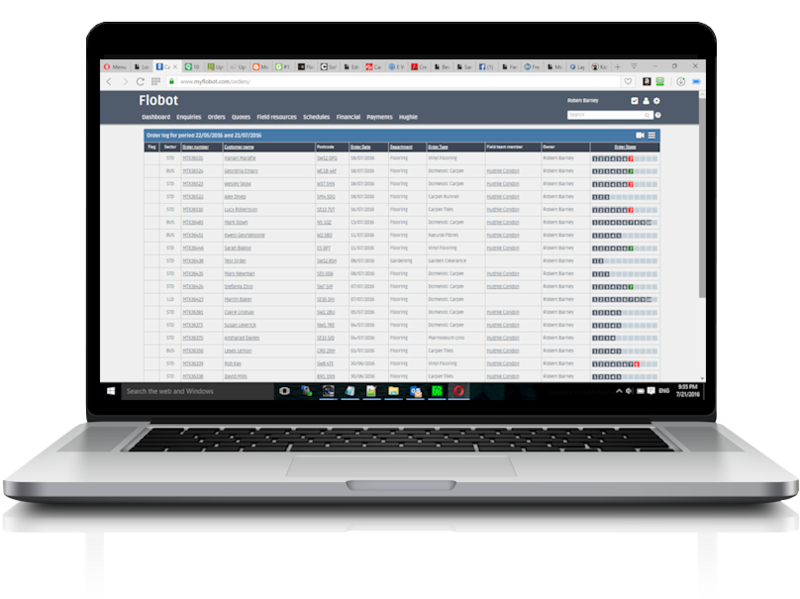 Hosted in the cloud and available through a browser on any device, Flobot system allows the user to control every aspect of the day to day running of the field service business. The dashboard gives real-time visibility of the jobs, the customers and the field engineers. Using this system the user can build and send estimates, issue invoices, receive payments from debit and credit cards, make customer notes, schedule field members for appointments and instantly update clients with the information about their jobs that they need to know.